Are you currently in the military and would like to take advantage of your earned military education benefits? Listed below are our Featured Military Schools we recommend you look into. Each school is different, some offer campus based programs and other offer 100% online programs. Many of the schools offer short-term certificate based training programs where others offer full Associate’s, Bachelor’s or Masters based degree programs. Scholarship on top of your military benefits can be available so make sure you inquire about all available tuition assistance benefits available to you as well as your family. The goal is to find a school that not only gives you the training you need but limit the out of pocket money you’ll owe. Many of the featured schools we list are Military Friendly and not only offer specific programs for military personnel but also special tuition pricing. 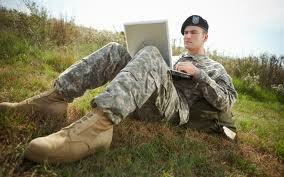 If you are an active duty soldier many of the schools will pay up to 100% of your tuition. Based on your branch of service your benefits vary. If your spouse wishes to take advantage of their benefits they could be eligible for up to $4000 over a 2 year fiscal year towards their education in a certificate, diploma or degree programs in a portable career. The skills you learned in the military can help you prepare for life outside of the military. Take advantage of the TA benefits you earned while in the military. The MGIB, better known as the Montgomery GI Bill® or Chapter 30 changed in 2009 and the new Post 9/11 GI Bill® is what the majority of active duty military will use towards their education. If you have served at least 90 full days of duty you are eligible for TA. Tuition Assistance (TA) could pay up to 100% of your schooling with an eligible school/college. TA covers up to $4500 per year or $225 per semester hour. Military service members have many options when it comes to getting the education they need to prepare for their post-military career or military promotion. Military education assistance programs can be used to support their educational endeavors by covering part, if not all, of their tuition costs. Military education assistance programs are designed to serve the needs of men and women in the military who are pursuing higher education. They are designed to provide service members and their families with financial options for their education. These military-friendly assistance programs may cover 100% of their tuition costs as well as fees associated with getting an education. Military Tuition Assistance – Congress has authorized the Army, Navy, Marines, Coast Guard and Air Force to pay up to 100 percent of tuition expenses for eligible members. Each service has different criteria for eligibility and the application process. The money awarded is normally paid directly to the school of choice. There is also a MTA Top Up program that can help pay for more expensive education courses. Montgomery GI Bill – The Montgomery GI Bill helps active service members get as much as $72,900 for education and/or up to 36 months of veteran education benefits. They can use these funds toward degree and certificate programs, as well as other kinds of training. Additionally, the Montgomery GI Bill offers benefits to Select Reserve Members. Post 9/11 GI Bill – The Post 9/11 GI Bill provides financial support for education and housing to individuals with at least 90 days of service on or after September 11, 2001, or individuals discharged with a service-connected disability after 30 days. They must have received an honorable discharge to be eligible for the Post-9/11 GI Bill. There is a special provision in the Post-9/11 GI Bill that offers education benefits for the spouses and children of service members and veterans. Under the new law, the Department of Defense is authorized to allow individuals who have served at least six years in the Armed Forces and who agree to serve at least another four years to transfer unused GI Bill entitlement to their spouse. In addition, when a service member reaches their 10-year anniversary, they can choose to transfer the benefit to any dependents, including spouse or children. Survivors' and Dependents' Educational Assistance Program – Even family members of veterans may be eligible for military education assistance programs. Qualified candidates can receive up to 45 months of education benefits. These benefits may be used for degree and certificate programs, apprenticeship, and on-the-job training. There are many options when it comes to military education assistance programs. Service members or their family members should conduct research if they want to determine which program best suits their needs. There are old and new programs available to help them pursue their education and career goals, with little or no out-of-pockets costs to them. For the latest information concerning military education benefits and procedures, please visit your education counseling office.